With new, efficient engines, new assistance systems, and a sharpened design, Mercedes-Benz has comprehensively modernised the E-Class to extend its leading position in the luxury segment even further. In both the Saloon and Estate models of the new-generation E-Class no fewer than 11 new or optimised assistance systems from the future S-Class celebrate their world premiere. They combine a host of comfort and safety features, all of which Mercedes-Benz refers to as "intelligent drive". They include systems which for the first time can help to prevent accidents with vehicles or pedestrians crossing the path of the car and driver. As such Mercedes-Benz is underscoring its leading position as a safety pioneer. The new-generation E-Class makes a significant step forward when it comes to efficiency and ecology too. This comes courtesy of new, powerful BlueDIRECT four-cylinder petrol engines featuring sophisticated direct injection technology. This development boost is reflected to impressive effect in the evolutionary design of the enhanced E-Class. The E-Class, equipped with a new front bumper and a skillfully revised side view, looks almost like a new car, and encapsulates efficiency, intelligence and emotional appeal in a visually superior manner. Mercedes-Benz has revised all of the model series of the E-Class more comprehensively than ever before, to make the latest technical advances available in practice at an early stage. This is why it even makes early use of developments from the future S-Class. In addition, the new-generation E-Class offers a considerably sharpened design with a revised front-end and an elegantly sporty look, as well as significantly enhanced comfort, high-quality appointments, efficiency and driving pleasure. The new-generation E-Class features a new front-end design as well as new proportions. When it came to the modifications, the designers followed the new Mercedes design idiom and reinterpreted the classical design values of the brand using the existing basis. The result is a superior and refined, sporty appearance. The front has been completely revised with new headlamps, which comprise all functional elements within a single headlamp lens. Flowing light elements within the headlamps help to ensure that the "four-eyed" look which is typical of the E-Class has been graphically retained. The headlamps are fitted with partial LED lights as standard, while full LED technology is available for the first time in this class as an option. 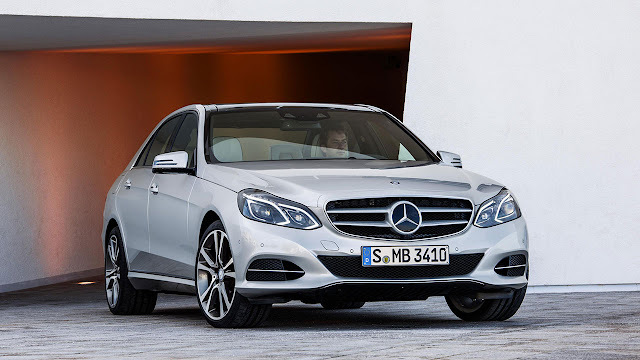 The E-Class is available with a new front-end design which incorporates the sports car radiator with central star, and as such offers an independent front-end look with a sporty emphasis. The bonnet and front bumper have also been redesigned too. With its flowing lines, the bonnet follows the new design idiom in a smooth, very straightforward manner. The bumper, which boasts a new shape and is free of all light functions, has a modern appearance and, along with the wing design of its spoiler lip, discreetly underscores the sporty credentials of the E-Class. 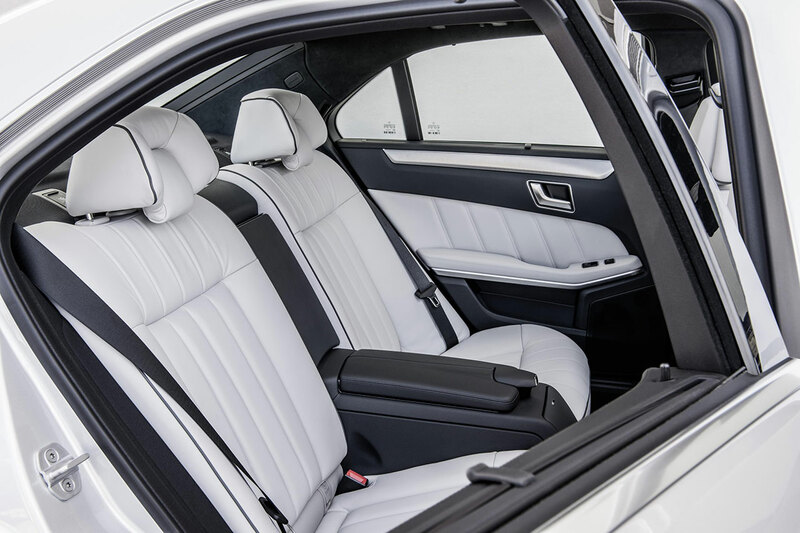 A new feature line and a repositioned three-dimensional trim strip give both the Saloon and Estate models new, visually exciting proportions. The feature line runs below the structure line from the rear door through to the tail light. Visually this benefits the vehicle in terms of length. It underscores the side trim, which has been shifted downwards. Overall the E-Class looks more elongated and elegant, yet at the same time both dynamic and composed. At the rear, the lights and bumper have been revised. The new horizontally structured LED tail lights with new two-tone look emphasise the width and feature a characteristic night design. The new rear bumper has a distinctive lip and a black insert with chrome badge. 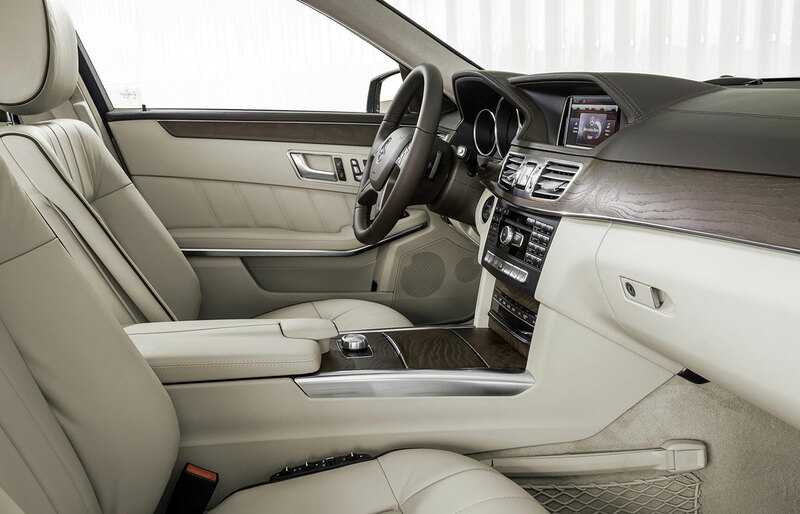 The interior of the new-generation E-Class has been subtly reworked and harmonised with the expressive exterior. High-quality materials and refined, subdivided areas with precise joints and sharp curves underscore the high-quality overall impression of the generous interior. A new feature is the two-part trim which stretches across the entire dashboard. It can be selected in a wood or aluminium look, irrespective of the equipment line. Also new are the 3-tube instrument cluster, the trapezoid-shaped, high-gloss framed display in the head unit with flat-frame look, the design of the air vents as well as an analogue clock between the two central air vents. The harmonious interior is characterised by the redesigned centre console without a selector lever, as well as a new multifunction steering wheel with DIRECT SELECT lever and shift paddles in conjunction with automatic transmission. What started with PRE-SAFE® and continued with DISTRONIC PLUS has resulted in a new dimension of motoring at Mercedes-Benz: comfort and safety are merged into one. Mercedes-Benz refers to this as "intelligent drive". In the new-generation E-Class a whole host of new or optimised systems from the future S-Class celebrate their world premiere, making motoring more comfortable and safer. The basis for all this is formed by state-of-the-art sensors and appropriate algorithms. Mercedes-Benz has made a major step forward with the introduction of the Stereo Multi-Purpose Camera. Just like the Multi-Purpose Camera fitted previously, it is positioned behind the windscreen in the vicinity of the rear-view mirror. However, this camera features two "eyes" set at an angle of 45 degrees that produce a three-dimensional view of the area up to around 50 metres in front of the vehicle. In this way, the stereo camera provides data for processing by various systems. Intelligent algorithms perform an evaluation of this three-dimensional visual information in order to detect and carry out a classification, both spatially and in terms of their movement, of vehicles that are driving ahead, oncoming or crossing, as well as pedestrians and a variety of traffic signs within a large field of vision. At the same time, along with the Stereo Multi Purpose Camera, Mercedes-Benz is also introducing enhanced versions of the multistage radar sensor system. As standard, both Saloon and Estate models are fitted with COLLISION PREVENTION ASSIST, a radar-based collision warning system with adaptive brake assist systems. It helps to significantly reduce the risk of a rear-end collision. Also forming part of the standard equipment is ATTENTION ASSIST, which is now able to warn of inattentiveness and drowsiness across a wider speed range, and also inform the driver about his level of fatigue and the amount of driving time which has elapsed since the last break. It also offers an adjustable sensitivity level. Both the E-Class Saloon and Estate are available with a particularly broad range of powerful and efficient petrol and diesel engines. All are fitted with ECO start/stop system and are highly efficient. A new element is the expansion of the BlueDIRECT petrol engine family with the addition of a four-cylinder petrol engine with spray-guided direct injection, based on the same trend-setting technology used in the latest generation of six and eight-cylinder engines from Mercedes-Benz. Its technology package includes fast-acting piezo injectors for multiple injection, quick multi-spark ignition, turbocharging, fully variable camshaft adjustment on the inlet and exhaust side, as well as a controlled oil pump. New developments for the four-cylinder engine include the first dynamic balancer with full anti-friction bearings to be used in a petrol engine, as well as a selectable water pump. The engine also sees the world's first use of the stratified lean burn process in combination with exhaust-gas turbocharging and external high-pressure exhaust gas recirculation. As a result the E-Class achieves a combined optimum consumption figure of 5.8 litres per 100 km (corresponding to 135 g/km CO2), and is therefore the only vehicle in this class to achieve efficiency class A. In addition, the new BlueDIRECT four-cylinder petrol engines already meet the EU6 standard which will apply from 2015. All BlueDIRECT petrol engines of the new E-Class combine a spontaneous response and exemplary power delivery with the highest levels of efficiency and best-in-class emissions performance. Some of the diesel models of the E-Class are available as BlueTEC models fitted with the established SCR (Selective Catalytic Reduction) technology and as such meet the EU6 emissions standard. 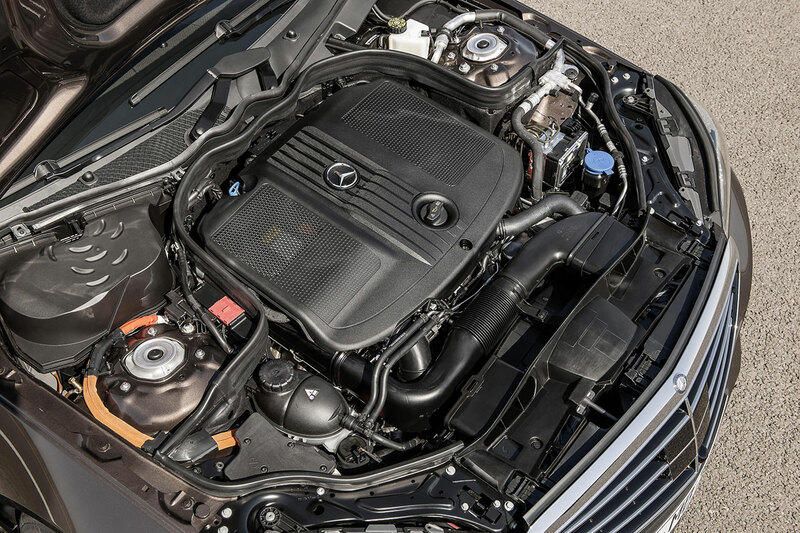 The comprehensive engine range is supplemented with the E 300 BlueTEC HYBRID. It combines the four-cylinder diesel engine with an electric motor, thereby producing a system output of 170 kW (231 hp) and 750 Nm of torque. 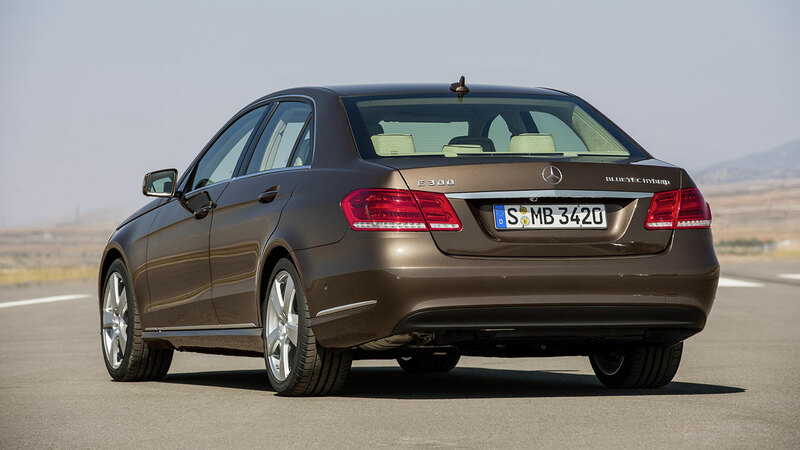 The E 300 BlueTEC HYBRID returns 69.0 mpg and emits CO2 emissions of 107 g/km. As such it occupies the leading position among the most economical models in the upper medium-size category. Mercedes-Benz will also offer two transmissions for the E-Class in the future: a 6-speed manual transmission with high ease of shifting and short shift travel, and the 7G-TRONIC PLUS automatic transmission with DIRECT SELECT lever and DIRECT SELECT shift paddles. This latest stage of evolution of the 7G-TRONIC PLUS provides significant advantages in terms of efficiency and ease of maintenance. A new feature is the short-term M mode. The benefit of this: if the driver has shifted up or down manually, after a set period of time the transmission independently switches back to automatic, fuel-efficient shift mode. All of the models of the E-Class family will in future be fitted with an electromechanical Direct-Steer system as standard. This combines the speed-dependent power assistance of speed-sensitive steering with a variable ratio across the steering angle range. The rack and pinion steering gear is controlled on-demand and therefore contributes towards efficiency. 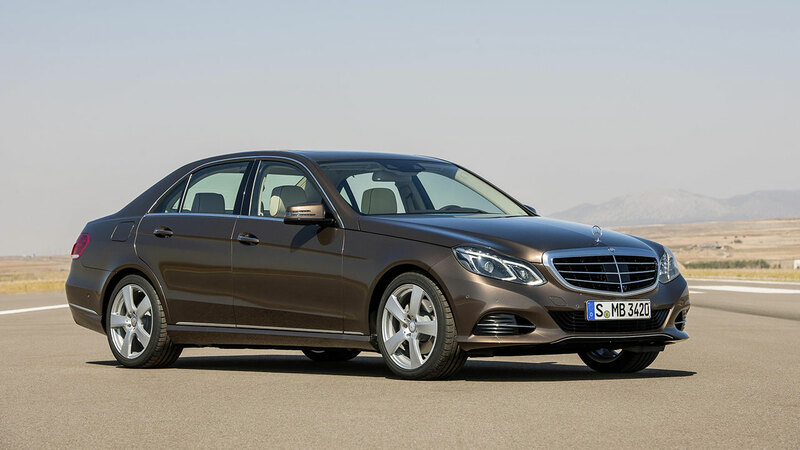 The new-generation E-Class is already fitted with a comprehensive series of high-quality appointments as standard. A modern range of infotainment systems helps to keep the driver up to date while on the road in terms of what is happening around the world or in the office. The systems also enable music to be enjoyed or also optionally offer powerful navigation solutions as well as an internet connection.